I said when Trump does something good I will give him props. 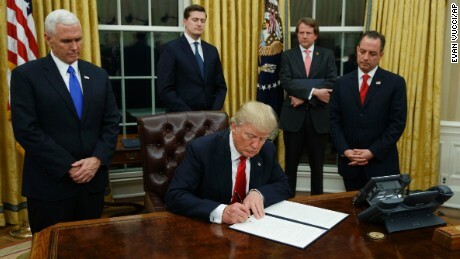 Trump has used an Executive Order to do away with the TPP (Trans Pacific Partnership), which is bad for America. You might say, but aren't you against a President using Executive Orders to get things done? I answer you, "ONLY when used unconstitutionally". An Executive Orders is only unconstitutional when it makes law or reverses laws made by Congress. TPP was a treaty never ratified by Congress, only agreed to by President Obama. Reversing things unilaterally done by another President is well within the proper use of an EO. My cheers on the topic of trade will be short, since it is to bad that Trump is going to counter that good act with something equally as bad at TPP ...tariffs, which will benefit American corporations, but not the average American, since it will make prices go up. Again, I am against Executive Orders used to write law or repeal laws passed by Congress. And when I hear Trump has done this, then I will go after him. Keeping you accountable Donald J Trump.